I have been home since Christmas day. Now, ten days later, almost everyone except me went to work or school yesterday. I have actually only left the house once since I got back. Twice actually. The first was to visit the real version of Maitland. There were only 7 of us there because most had not yet returned from the subcontinent. We almost all even had real beds. The second was to shovel the driveway because Alan went to Toronto to visit his sister and the snowplow had installed a huge 2 foot pile of icy snow at the end of our driveway. 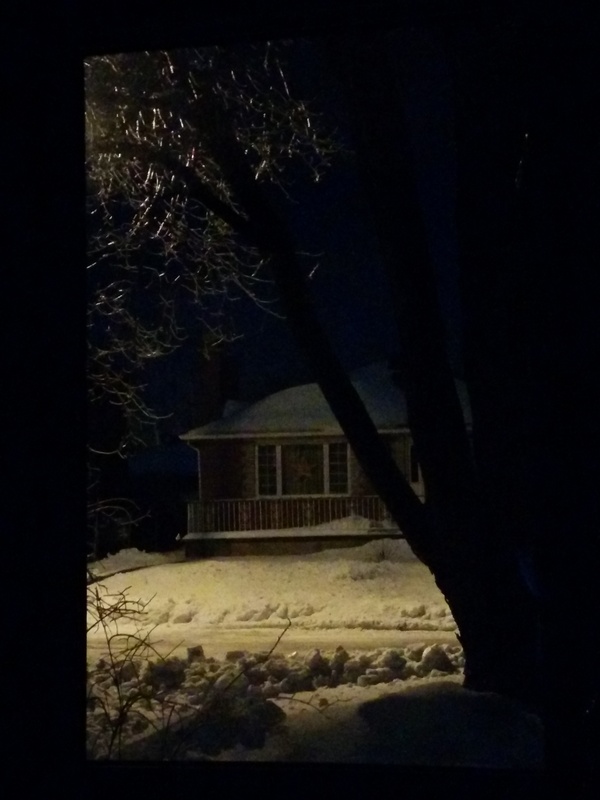 Wait, did I mention the snow/freezing rain storm?…well we had one. Quel mistake! I managed to twist my back and now I have sciatica, but don’t worry, it’s only a flesh wound. I have been playing the part of a hermit since we got home for a couple of reasons, not the least of which is that my intestines only decided to leave India two days ago–could be worse, it has taken up to a month on previous visits. The second is that I have just not readjusted my internal clock. As a matter of fact, I am not sure I even have one anymore. ANYWAY, it is 2 in the morning and I am up and sitting in the dark. I snapped a view from my chair of the ice on the branches of our maple tree (Canadian, eh?) lit by the streetlamp across the street. Home again, home again, lickety split. This entry was posted in travel and tagged home, India, travel on January 6, 2015 by gillianknitter.